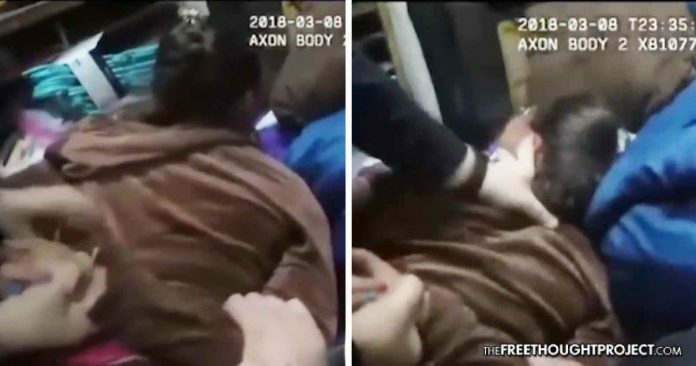 Body camera footage of a cop attacking an apparently innocent 13-year-old girl was so troubling that his fellow cops crossed the thin blue line to turn him in. He has since been suspended and charged with assault. Gloucester Township, PA — Body camera footage of a Gloucester Township police officer was recently released which captured the disturbing assault of a small 13-year-old girl by a massive cop. The attack was so deeply troubling that the officer has actually been suspended and subsequently charged—after his own cops turned on him. The incident began on March 8 and was captured on another officer’s body camera. It shows Gloucester Township police officer John Flinn repeatedly punching and attempting to choke a small 13-year-old girl as he places her in handcuffs. Police originally said they were responding to a disturbance call in the Camdem County township. However, no more details on why they contacted the 13-year-old girl have been released. As the video shows, when the police are attempting to apprehend the young girl, she originally tells them to get off of her. However, she then quickly complies and lays down on her stomach. As the girl calmly lays there, allowing Flinn to place her in cuffs, for no reason, he yells at her to stop resisting and begins punching the 13-year-old in the face. He then grabs her by the neck, doles out multiple knee strikes before shoving his 250-pound knee in the back of her neck. All the while, the girl is screaming in agony. After the brutal beating caught on Flinn’s fellow officer’s body camera, the girl was taken to an area hospital to be evaluated and treated for injuries sustained during the attack. Not that there would be justification for a grown man to ever savagely beat a non-violent 13-year-old girl, however, to illustrate just how unnecessary the attack was—the girl was not charged with any crime. What stands out about this case—aside from the obvious child-beating cop—is the fact that his conduct was reported, not by the victim, but by a fellow officer. According to a statement obtained by the Free Thought Project, the Gloucester Township Police chief, Harry Earle explained that it was the officer’s supervisor who turned him in for the beating first, not the 13-year-old girl. The incident occurred on March 8th, and it was initially investigated that evening by the officer’s supervisor who immediately recognized as what he believed behavior that was inconsistent with the training and values of the Gloucester Township Police Department. The supervisor contacted higher level police command who initiated a full internal affairs investigation under my authority. It is important to know that the initial supervisory review and subsequent internal affairs investigation were generated by the officer’s supervisor and not as a result of any civilian complaints. Chief Earle went on to to explain that the subsequent investigation led to the officer being suspended on March 15 and finally to charges last week. “I am proud that any employee of the Gloucester Township Police Department well understands that they must report any improper conduct. It is clear that all members of the department have the confidence that allegations of conduct that are improper, unlawful, or that do not meet the standards of our guiding principles of Honor, Integrity, Compassion, Respect, Fairness, and Courage will be thoroughly investigated and dealt with swiftly,” said the chief. Chief Earle then went a step further and posted two email addresses at which citizens can follow up with complaints about any other officers or give the department feedback. “Anyone who has a concern about an officer’s performance or actions may report that issue to Internal Affairs at [email protected] Officers also greatly appreciate positive feedback regarding their every day hard work and dedication and such messages may be sent to [email protected],” read the statement. As TFTP has reported countless times, police officers protecting their own by refusing to charge abusive and corrupt cops is what leads to the problem with policing we see today. The proactive nature of the Gloucester Township police department is what fixes this problem. Normally, TFTP would ask our readers to contact the department and demand the officer be held accountable. However, that appears to be unnecessary this time and it is a positive sign. Now, if we can just figure out a way to stop cops from brutally attacking small girls—before it happens. Below is the video that is so horrendous, cops crossed the thin blue line to go after one of their own. Warning, it contains graphic content.